It looked like Florida was headed towards another tough loss– then KeVaughn Allen showed up. 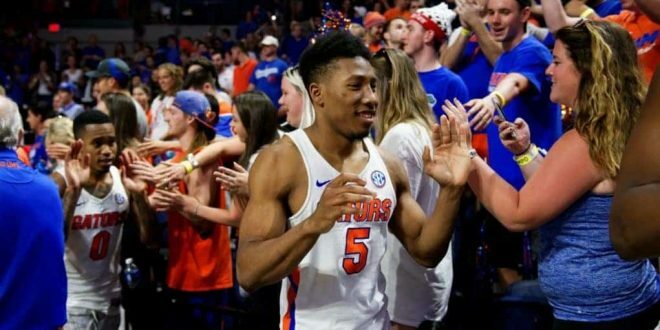 The senior had one of his best games of his career as he scored 31 points on 10-for-16 shooting to give the Gators an 81-72 win over the Texas A&M Aggies. Florida trailed by 13 at the half but shot the lights out in the 2nd half, outscoring the Aggies 48-26. 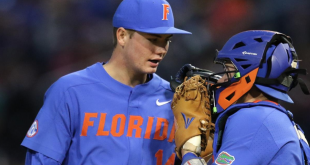 Florida answered the bell in a different way on Tuesday night. The Gators did not play good defense in the first half. Just to put it in perspective, Texas A&M scored a total of 43 points against Missouri. The Aggies scored 46 in the first half against Florida. The Florida defense set the tone in the 2nd half. Texas A&M only made two threes in the second period compared to their seven in the first. Down the stretch against Tennessee, Florida needed Allen to step up down the stretch and he didn’t. 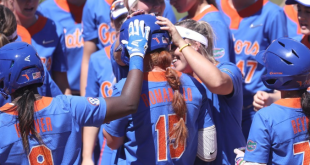 Even though Florida took a tough loss that day, that may have been the reason they won on Tuesday night. Allen he told his team he wanted the ball down the stretch, something he had never done before. The senior was on fire from downtown, yet he didn’t let that affect his shot selection. He was aggressive and efficient at the same time. When it comes to asking for the ball down the stretch, Allen feels that it not only shows his improvement on the court but also off of it. The North Little Rock, Arkansas native didn’t just start jacking up threes. He was efficient with his shot selection, and he made 8 of his 10 three-point attempts. It probably should have been 7-for-10 had it not been for a fadeaway three that hit off the backboard and went in, causing Allen to smile. Head Coach Mike White said ”he called bank” in the postgame press conference when asked about the shot. “Everyone knows what he is capable of so it’s nice to see him do it,” White said. Florida was the only team in Division I college basketball without a player who scored 20 or more points in a game, Allen had 17 alone in the 2nd half. All year long Gator fans have seen the sharpshooting ability of freshman Noah Locke. The Owings Mill, Maryland native took it to the next level as he scored 27 points on 9-for-18 shooting. Just like Allen, Locke was dialed in from the three-point line as he made seven of his thirteen shot attempts from deep. In fact, Allen and Locke broke the team record for most three-pointers made by two players in school history with 15. With the win, the Gators improve to 11-7 overall and 3-3 in SEC play. 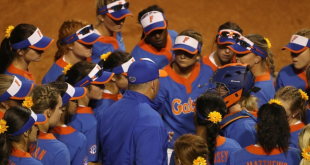 Florida gets the rest of the week off as they begin to prepare for their weekend match-up against TCU. They will be traveling to Fort Worth for a Saturday tip-off against the Horned Frogs at noon.